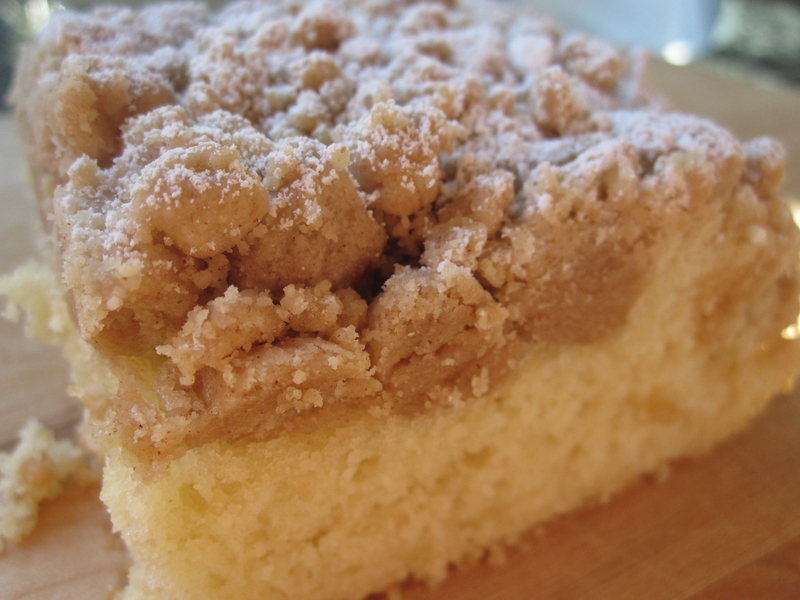 I wanted to make a coffee cake- like the kind they sell at Cromer’s out by the beach. This recipe was pretty on point. A few stipulations from the folks at America’s Test Kitchen. “Don’t be tempted to substitute all-purpose flour for the cake flour, as doing so will make a dry, tough cake.” If you don’t have buttermilk, they say you can use an equal amount of plain-low fat yogurt. As I didn’t have either- I made sour milk- as I learned in Maine- add 1 tsp lemon juice to 1 cup milk, stir and let sit for 5 minutes (in this instance 1/3 tsp to 1/3 cup milk). This seems much more efficient to me anyhow because I always buy a big carton of buttermilk, and only use a cup and the rest goes to waste. [I don’t understand why they don’t sell buttermilk in 8oz cartons like heavy cream.] Test kitchen also says you can double this recipe for a 9×13 inch pan, increase baking time to about 45 mins. But really, unless you are having 20 people over, the 8×8 is plenty. The only ridiculous part of the recipe, is actually forming all the topping into individual pea-sized crumbs (roll between thumb and forefinger). This took a bit of time– Rach Weins was a superstar crumb-maker. She and I did a test corner- with just a willy nilly sprinkling- to see if the individual crumbing was worth the effort- and it definitely is. Also, this is surprisingly a pretty legit cake- not just a holder for the crumbs. As with most brunchy treats, it really tastes best same day. 1. Topping: Whisk sugars, cinnamon, salt, and butter in medium bowl to combine. Add flour and stir with rubber spatula or wooden spoon until mixture resembles thick, cohesive dough; set aside to cool to room temperature, 10 to 15 minutes. 4. Transfer batter to baking pan; using rubber spatula, spread batter into even layer. Break apart crumb topping into large pea-sized pieces and spread in even layer over batter, beginning with edges and then working toward center. Bake until crumbs are golden and wooden skewer inserted into center of cake comes out clean, 35 to 40 minutes. Cool on wire rack at least 30 minutes. Remove cake from pan by lifting parchment overhang. Dust with confectioners’ sugar just before serving. How much is a willy nilly sprinkling? Is that more or less than a tad? A pinch? Are you using a new camera? I just got hard from the macrotastic qualities of this image.